How do I add content blocks to a proposal? 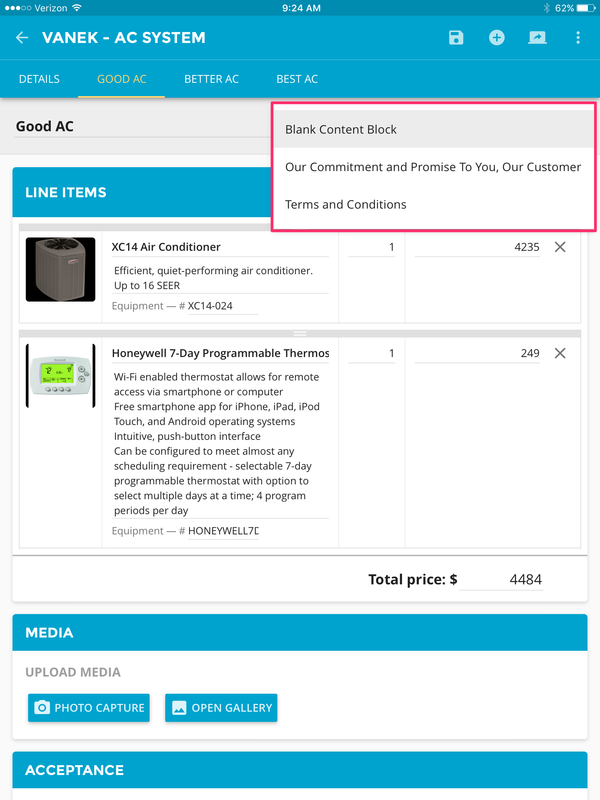 button in the upper right hand corner to add a Content Block to the selected proposed option. 4. You can create a new Content Block for this proposed option, or you can select one of the existing Content Blocks. 5. If you select one of the existing Content Blocks, it will be placed onto the option automatically. If you select "Blank Content Block," a blank block will be attached to the proposed option and you can begin creating the custom Content Block for this option. *Keep in mind, that when creating a custom Content Block for an option, that this is ONLY for this option of the Proposal. If you want this Content Block to be on every option for this Proposal, you will need to re-create it for each option. An easy way around this would be to add a Content Block that everyone can use. Instructions on how to do this HERE. If you have any additional questions, please feel free to contact the Acquire Support Team at [email protected] or 1-800-566-6940.